Have you ever questioned if God exists? Or have you wondered if God is really the God described in the Bible, and if He really is all that powerful and good? Some of the deepest struggles we can have as Christians are struggles with doubt. Like fire, a lie begins with a spark and generates its own energy as it destroys its victim. Satan is the master liar and he will destroy our mind if we let him. Just like lies and half-truths destroy the reputation of a leader, Sometimes we look around us and see what is happening in world or in our own lives, and Satan suggests we consider if God exists or if He really is in charge of things. 1) The Protection factor. God, whose side are you on? Are you for me or against me? a) The lie: God is against you. All your trouble is coming from God. He has let you down. He has let calamity befall you. b) The Truth: God is for me. I am His child. Is 49:15-16 Can a mother forget the baby at her breast and have no compassion on the child she has borne? Though she may forget, I will not forget you! See, I have engraved you on the palms of my hands; your walls are ever before me. 2) The Provision factor. Are you depriving me, God? Will you really provide all my needs? a) The lie: Everybody else is blessed by pursuing the world’s riches and pleasures. b) The Truth: God is blessing me. He meets all my needs and He is preparing a place for me unlike anything on earth with true riches that no thief can steal. Phil 1:6 being confident of this, that he who began a good work in you will carry it on to completion until the day of Christ Jesus. 3) The Prosecution factor. My sins are ever before me. I can’t forget them. Will God condemn me to hell? a) The lie: God is angry with me and accusing me. 4) The Parting factor. Where are you, God? I feel so alone. Have you left me? a) The lie: God has abandoned me. God is far away and unconcerned about my life. b) The Truth: God will never leave me. Nothing can separate me from God and His love. Romans 8:31-39 What, then, shall we say in response to this? If God is for us, who can be against us? He who did not spare his own Son, but gave him up for us all--how will he not also, along with him, graciously give us all things? Who will bring any charge against those whom God has chosen? It is God who justifies. Who is he that condemns? Christ Jesus, who died--more than that, who was raised to life--is at the right hand of God and is also interceding for us. Who shall separate us from the love of Christ? Shall trouble or hardship or persecution or famine or nakedness or danger or sword? As it is written: "For your sake we face death all day long; we are considered as sheep to be slaughtered." No, in all these things we are more than conquerors through him who loved us. For I am convinced that neither death nor life, neither angels nor demons, neither the present nor the future, nor any powers, neither height nor depth, nor anything else in all creation, will be able to separate us from the love of God that is in Christ Jesus our Lord. Furthermore, to make us ineffective in prayer, Satan whispers lies of doubt that God exists or that He hears our prayers. James 1:6-8 But when he asks, he must believe and not doubt, because he who doubts is like a wave of the sea, blown and tossed by the wind. That man should not think he will receive anything from the Lord; he is a double–minded man, unstable in all he does. Whereas, faith in God has this result. 1John 5:14-15 This is the confidence we have in approaching God: that if we ask anything according to his will, he hears us. And if we knows that he hears us – whatever we ask – we know we have what we asked of him. Matthew 14:26-33 During the fourth watch of the night Jesus went out to them, walking on the lake. When the disciples saw him walking on the lake, they were terrified. "It's a ghost," they said, and cried out in fear. But Jesus immediately said to them: "Take courage! It is I. Don't be afraid." "Lord, if it's you," Peter replied, "tell me to come to you on the water." "Come," he said. Then Peter got down out of the boat, walked on the water and came toward Jesus. But when he saw the wind, he was afraid and, beginning to sink, cried out, "Lord, save me!" Immediately Jesus reached out his hand and caught him. "You of little faith," he said, "why did you doubt?" And when they climbed into the boat, the wind died down. Then those who were in the boat worshiped him, saying, "Truly you are the Son of God.". People of faith deal with periods of doubt in their lives because of fear, physical needs, and a whole host of reasons. If you are a person who is attempting to be more like Jesus Christ, then Satan will attack with doubt; such as, “You will never achieve Christ-likeness, so you might as well give up.” But after Jesus rescues us from Satan’s lies and the battle with doubt is over, our faith is increased and stronger against the next assault. There are many more examples of this. Genesis 12 and 20 tell of Abraham (who was considered righteous because of his faith) while in Egypt, feared Pharaoh, doubted God’s protection, and lied about Sarah being his wife, not once, but twice. Exodus 14 tells about the people of God walking miraculously on dry ground through the Red Sea. But just a few chapters later (Exodus 16 & 17), they were doubting God’s provision because they were hungry and thirsty. In 1Kings 18, the prophet Elijah experienced a huge victory over the prophets of Baal. But in chapter 19, we find him hiding in the desert from Jezebel’s persecution and doubting that God would rescue him. The most famous doubter was one of Jesus’ closest companions. Jesus has departed through death on a cross. Thomas felt abandoned and disillusioned. When he receives the news that Jesus is risen from the dead, he does not believe it. John 20:25 So the other disciples told him, "We have seen the Lord!" But he said to them, "Unless I see the nail marks in his hands and put my finger where the nails were, and put my hand into his side, I will not believe it." That could just be pessimism talking or a seriously defeated attitude; nevertheless, Jesus appears later to rectify the situation. John 20:26-29 A week later his disciples were in the house again, and Thomas was with them. Though the doors were locked, Jesus came and stood among them and said, "Peace be with you!" Then he said to Thomas, "Put your finger here; see my hands. Reach out your hand and put it into my side. Stop doubting and believe." Thomas said to him, "My Lord and my God!" Then Jesus told him, "Because you have seen me, you have believed; blessed are those who have not seen and yet have believed." There was another person who had to deal with doubt. We do not expect it from him because he baptized Jesus and proclaimed Him as the “Lamb of God who takes away the sin of the world”. 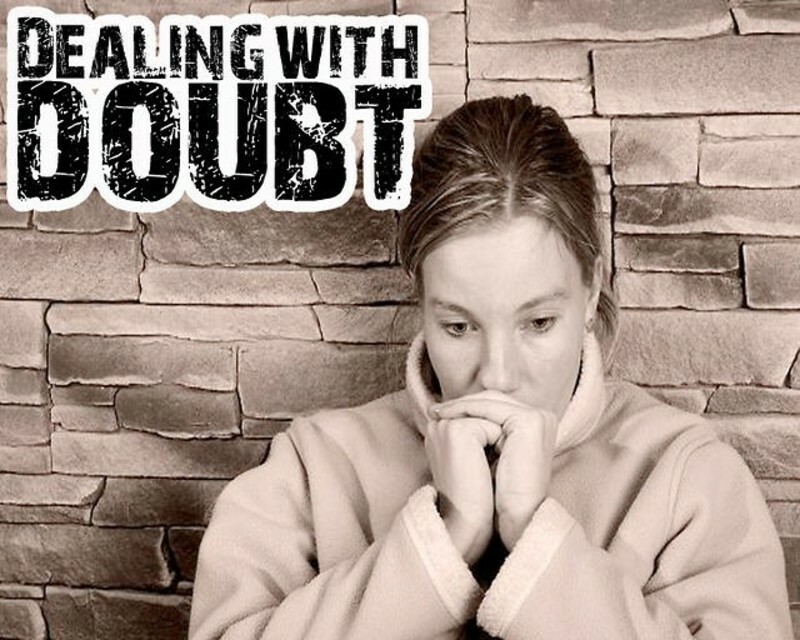 Yes, even John the Baptist dealt with doubts and that is amazing to us. Sometimes we think that ministers or those we look up to are immune from having doubts. This simply isn’t true. All people have doubts, but not all people deal with doubts well. However, John dealt with his doubts well and we can learn from his experience. When John the Baptist baptized Jesus Christ to fulfill all righteousness, John saw the Holy Spirit of God light upon Jesus. Then Jesus went into the wilderness. Satan came and tried to get Jesus to question God and create doubt, but Jesus defeated Satan’s lies with the truth of the Word. Later, John the Baptist is put in prison by King Herod. Jesus is now ministering among the people and teaching. He is calling disciples to follow Him. Miracles are occurring! Jesus healed the centurion’s servant without even being present. Jesus placed his hands on the coffin of a dead man and he was returned to his family alive and well. News about Jesus was spreading. Luke 7:16-17 They were all filled with awe and praised God. "A great prophet has appeared among us," they said. "God has come to help his people." This news about Jesus spread throughout Judea and the surrounding country. The news even reached John the Baptist in prison. Yet, for some reason a twinge of doubt crept into John the Baptist. Maybe John was waiting for Jesus to declare He is the Messiah. Maybe he was expecting Jesus to lead an armed revolt like other Jews believed. Maybe he expected Jesus to free him from prison since he had devoted his life to proclaiming the coming of the Messiah. Whatever the reason, John the Baptist wondered if his faith was in the right person. So he sent messengers to find out if Jesus was in fact the Messiah. Luke 7:18-28 John's disciples told him about all these things. Calling two of them, he sent them to the Lord to ask, "Are you the one who was to come, or should we expect someone else?" When the men came to Jesus, they said, "John the Baptist sent us to you to ask, 'Are you the one who was to come, or should we expect someone else?'" At that very time Jesus cured many who had diseases, sicknesses and evil spirits, and gave sight to many who were blind. So he replied to the messengers, "Go back and report to John what you have seen and heard: The blind receive sight, the lame walk, those who have leprosy are cured, the deaf hear, the dead are raised, and the good news is preached to the poor. Blessed is the man who does not fall away on account of me." After John's messengers left, Jesus began to speak to the crowd about John: "What did you go out into the desert to see? A reed swayed by the wind? If not, what did you go out to see? A man dressed in fine clothes? No, those who wear expensive clothes and indulge in luxury are in palaces. But what did you go out to see? A prophet? Yes, I tell you, and more than a prophet. This is the one about whom it is written: "'I will send my messenger ahead of you, who will prepare your way before you.' I tell you, among those born of women there is no one greater than John; yet the one who is least in the kingdom of God is greater than he." From this passage, we learn three valuable lessons from John the Baptist about how to deal with our doubt, whether it is from fear, unmet expectations, loss, or need. The first lesson we learn about dealing with doubt comes not only from this passage in the life of John the Baptist, but also from the life of Abraham, the people of Israel, Elijah, and Thomas. The lesson is - that we should expect Satan to attack us with doubt and prepare to deal with it. Expectations of life, of God, and of each other do not get met. A loss, or death, or sickness occurs. All these create an opportunity for doubt, which can grow, if we don’t deal with it. So the first lesson we learn from John the Baptist is that we are not immune from doubt. 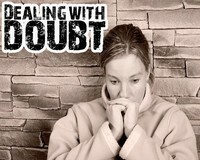 Doubt will be a part of the spiritual battle in our lives, and we need to expect it, and plan to deal with it. The second lesson we learn from John the Baptist is that we need to go to the source of truth to deal with doubt. John needed some real answers about Jesus. John the Baptist did not rely on hearsay, but went right to the source with his questions. John did not send his messengers to the Pharisees or other authorities. He had questions about Jesus, so he went to Jesus. If you have a doubt about God, go to the source of truth. Go to God in persistent prayer, seeking answers to your questions and doubts. Read the Scriptures about what you are doubting. Attend a Bible study group where you can ask questions and be encouraged. Talk with someone who is mature in the faith, who has dealt with the same doubts. All of these suggestions will get you attacking doubt with the source of truth, rather than letting doubt attack you with lies from Satan. The third lesson we learn from John the Baptist’s battle with doubt comes from Jesus’ answer to John. When someone doubts us, we are insulted that the other person does not believe us. Jesus did not respond that way. In fact, Jesus publicly commended John and understood that he needed validation, confirmation, and encouragement. Jesus answered John by having him look at the evidence. "Go back and report to John what you have seen and heard: The blind receive sight, the lame walk, those who have leprosy are cured, the deaf hear, the dead are raised, and the good news is preached to the poor. Blessed is the man who does not fall away on account of me." There is evidence of God all around us if we would look at it instead of our doubt. Jesus is encouraging John to do this. Based on the prophesies that John knew, what John had experienced with Jesus, and on the present evidence of what is seen and heard, Jesus indicates to John that He is indeed the Messiah that was promised and encourages him not to fall away or quit believing. Like John, sometimes our circumstances discourage us and we doubt God’s presence. God does not meet our expectations and we wonder if He is there. We get afraid and we doubt God’s provision. God does not heal someone we love and we doubt God’s power. We experience something horrific, or someone in our family does, and we doubt that God cares or exists. Jesus understands our honest doubts and invites us to look at the evidence of God’s faithfulness, power, presence, healing, will, and mercy. How has God acted before? How does the Bible describe God acting in times like we are experiencing? What does God promise through His Word for situations like we are dealing with? In the midst of our discouragement, it is not easy to see God when we doubt He is there or that He cares. However, that is why we must go to the source of truth and ask God for faith to see the evidence of His working in our life. I am not sure what doubts you are dealing with today, but I hope you will begin to doubt your doubts. Maybe you are dealing with doubts that God actually exists. Maybe you are doubting that God can forgive you for what you have done. Maybe it has been so long since you felt God’s presence you wonder if He is there. Maybe you have suffered a loss and you wonder if God has turned His back on you. No matter the doubt you are dealing with, God understands and He does not condemn us. He understands that we deal with fear, loss, expectations, and a whole host of other factors that cause doubt. Yet, we cannot leave doubt alone, for it comes from the lies of Satan. Doubts will arise; expect them, but don’t leave them alone to destroy your faith. Attack doubt by going to the source of truth, the Creator. Don’t focus on your doubts, but look at the evidence for faith and begin to doubt your doubts. John the Baptist was never released from prison, nor did Jesus try to free him. John was beheaded by King Herod. However, before he died, John no longer doubted. He was confident that he knew the Messiah, Jesus Christ, and without a doubt he knew he would live forever because he had put his faith in the Savior. Have you put your faith in the Savior, Jesus Christ? Maybe not all your questions are answered yet, but I invite you to come as a child, without all the answers, by putting your faith in the One who created you and died for you. With faith as small as a mustard seed, believe that Jesus is the Son of God, who atoned for your sin. Give your life to Him, repent, and be baptized for the forgiveness of your sin and a new birth of the Holy Spirit. He will lead you and guide you to discover all the answers to your questions.